A savage revision of a well-worn holiday tradition; A sardonic look at what Christmas really means; A VH1 episode of 'Where are they now?'. However you might call this, it is Pure Genius. The Grinch becomes a rastafarian and undergoes a heart-enlargement operation, primarily through the repeated application of medical marijuana. "Love and peace, mon." LMB decides to cash in on the latest fad in commercials - hipsters in weird hairstyles flailing their limbs spastically in silhouette. The spirit was willing but the flesh was weak. Due to a scarcity of suitably trained art-school dreadlocked potheads, LMB had to go with what was available - a girl stumbling across the screen after too many jagermeisters. Closer inspection reveals a cigarette-like object in her mouth. Maybe this is LMB's own PSA: to portray the harmful effects of drinking and smoking with their banner ad. Lately I've been getting a lot of hits from... that's right, LOWERMYBILLS.COM. Guys, if you're reading this, please know that I kid because I love. Here's one by Ameriquest; They decided to go with the 'animal' motif and looked hard to find one that wasn't already done by LMB. The cow! Ameriquests's ad makers rubbed their hands in glee. How could LMB have forgotten one of the most hilarious creatures of the animal kingdom!? Thus the brandname bovine was created, which not only speaks, but speaks in color. 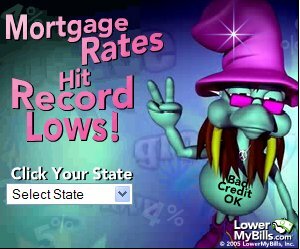 The cow seems as surprised as us that it can vocalize its strong sentiments towards the current mortgage market. As an afterthought, the creators also have a house glowing in yellow in the background. LowerMyBillsWatch is proud to present these aspiring losers, who despite their valiant attempts, fall much short of what LMB achieves.